This 6 foot fiberglass ladder has a type IA duty rating with load capacity of 300 pounds. This ladder combines the shelf and step ladder for a 2 in 1 combination made to take on multiple placement locations. The shelf design and its unique Pro top and innovative locking mechanism allows for positioning against a wall, building, or pole. When unlocked, this ladder sets up as a regular step ladder. The angles of the step ladder allow the capability to get closer to the work area. The cross-step ladder is equipped with a V-shape Pro top with non-marring slip resistant rubber tread that allows it to be placed safely on corners and poles. This ladder's Pro top also features a magnet and multiple slots that allow quick and easy access to your tools. Other features include Louisville Ladder patented shox impact absorption system, new raptor boot with bonded heavy duty slip resistant tread, inside spreader braces that protect the ladder during transport, heavy duty reinforcements and double rivets. 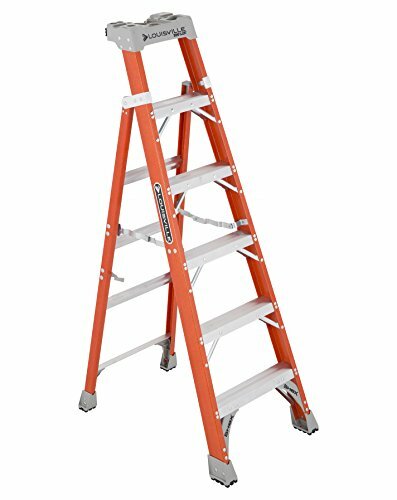 The new Louisville FXS1506 fiberglass cross-step ladder meets or exceeds the safety standards set by ansi, csa and osha.